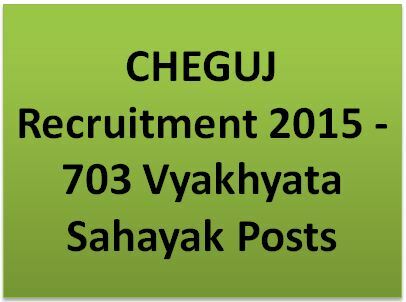 Commissionerate of Higher Education Government of Gujarat – CHEGUJ Recruitment 2015 notification for the 703 Posts of Vyakhyata Sahayak Published on official website www.cheguj.com . pay pf Rs. 25000/- per month for the academic year 2015-16. Click on ‘Application Registration’ and register with your email address. Now Click on ‘ Application Form’ and login with Email Address and password. Then fill the application form and submit application fees.